The Next Generation Science Standards (NGSS) call for substantial changes in science teaching and learning. Given this context, how are school districts escalating their planning efforts to implement NGSS? Intended for district-level administrators and state education policymakers, this evaluation report describes lessons learned as a cohort of California school districts develops and uses master plans for NGSS implementation. 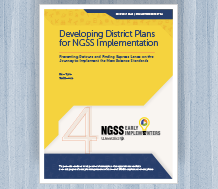 Visit the Developing District Plans for NGSS Implementation: Preventing Detours and Finding Express Lanes on the Journey to Implement the New Science Standards resource page to download your copy.